We’ll no doubt be wrong, but here’s our top 10 teams going into the BAFA 2019 Premier Division season! The champs obviously top our standings after a dominant 2018 saw them go back-to-back in British Finals. They’ve not lost any real talent of note, but added GB Lion and Danish national squad talent to their star-studded roster. We’re putting our money on them to three-peat. Think this is a little high? Think again. The freshly promoted London side have been on the scene for a number of years, and we’ve got a hunch that they’re going to mixthings up in the SEC. Recent wins over the Buttonhookers and Hornets – the two finalists from last year – have us excited about their title prospects. This might seem a bit ambitious given their disappointing showing at the playoffs last year, but hear us out – you should all look out for the 2014 champions. The SWC Dragons had Hurricanes playing pivotal roles at almost every position as they took home the Super 5s trophy. More important, they’re really not going to be challenged throughout the regular season in the SWC, as the Titans figure to take a step back and the Spartans are still a little way off from toppling this Welsh outfit. With such a straightforward path to the finals, we’re liking the Hurricanes’ chances this year. They got rocked in the final of last year’s playoffs by the Buttonhookers, and didn’t look overly convincing on the way there. 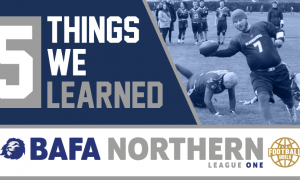 After an undefeated regular season, they limped past the Northants Titans and Sheffield Giants before being put to the sword by the Buttonhookers. They did suffer a ridiculous rash of injuries by the time they got there, and they’ve re-stocked their roster with some exciting additions. They’re the team in the HNC with the most recent success – can they still top one of the most competitive divisions in the country? 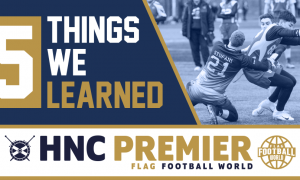 The Titans took a major step forward in their development as a flag program with their division win in 2018. Now with the Sheffield Giants gone, they’ve got a far smoother path to the playoffs. They lost to the excellent London Rebels at the playoffs, but we fancy their chances of taking another step towards the title this year. The Rebels are the team who will almost definitely make us look the most ridiculous as we slot them in at #6. With multiple national titles in their trophy cabinet, the Rebels have the pedigree to be a favourite to run the table on any given day. With the Smoke now in the division, their task of making playoffs got a lot more difficult, but no-one will want to face Calvin and co. if they make the finals. 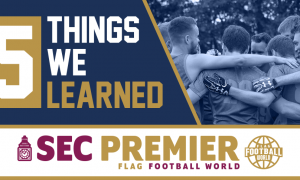 The 2018 Broncos were ravaged with injury and a playoff format that did not favour them, as they finished third in the HNC – an excellent record given the circumstances. This year, they can qualify with a good enough record, and are a tricky proposition for any team when they’re full strength. They’ll get talisman Fraser Thomson back in time for finals – can they finally push for a title? The Spartans joined the SWC to mixed reviews early on, but by season’s end, they had established themselves as a force. After acquitting themselves well against their former SEC division-mates, they pushed the Northants Titans to the very limit, losing out on a playoff spot due to an unfortunate tiebreaker. This year, we’ve got them firmly as the second team in the SWC – but they may miss out on playoffs again if the Rebels have anything to say about it. The Crows round off our top 10 as the most likely challengers in the MEC. They’ve always had a very talented roster, but haven’t quite put things together against the likes of the Sheffield Giants. With the Giants now out the picture, and after a late-season win against the Titans, the Crows will feel they’re ready to step forward and compete for a playoff spot.